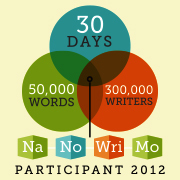 I’m over at Cindy Vine’s Blog today talking about my Crazy Days With NaNoWriMo. Are you thinking about writing a novel in a month this year? It is truly crazy, but a wonderful way to get in writing shape (I see those flabby adverbs). Here is an excerpt or you can read the entire article at Cindy Vine’s Blog. Don’t Give Up: So there I was, on the last night of NaNoWriMo with 47,000 words and an important choir rehearsal to go to at my church. Did I mention the end of November also coincides with the beginning of all the Christmas crazy scheduling? It does. I was ready to give up. I could cling to the fact that I had done so much in one month, and I just felt like I was out of story to tell. Other writers write books that are hundreds of thousands words long and someday I hope to be one, but for right now I am what I am. I was trying to write but ~BLOCK~. Then it hit me, probably as I drove to choir. Let’s hit somebody in the head with a frying pan!….